agribusiness-jobs.de:In the first half of 2015 the profit of Royal FrieslandCampina N.V. rose by 85 percent to 192 million euro (first half of 2014: 104 million euro). 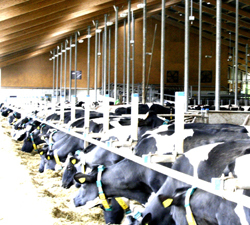 First half of 2015: interim pay-out to member dairy farmers up by 145%. Margins rose due to the sale of more products with a higher added-value, positive currency translation effects, lower purchasing costs and the lower guaranteed price for raw milk. At 5,645 million euro revenue was at the same level as in the same period in 2014 (5,635 million euro). The milk price for member dairy farmers fell to 36.48 euro per 100 kilos of milk (first half of 2014: 44.19 euro) due to the lower guaranteed price for raw milk. Roelof Joosten, CEO of Royal FrieslandCampina N.V.: “In the current uncertain markets we were able to achieve a good result. This proves the success of the route2020 strategy, aimed at achieving sustainable growth and value creation, which we have followed since 2010." Labels: Agrar Jobs, agribusiness-jobs.de - Landwirtschaft Jobs, CEO, Jobs Agraringenieure, LMV-Consulting, lmv-jobboerse - lmv presse - Manfred Lorenzen, Roelof Joosten, Soest - FrieslandCampina N.V.